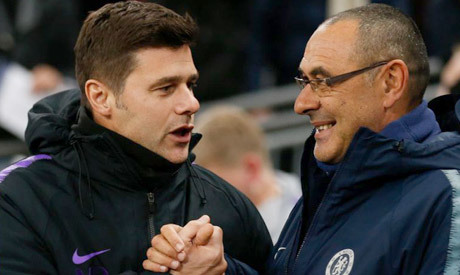 Tottenham Hotspur and Chelsea have warned their supporters to behave during Tuesday's League Cup semi-final first leg at Wembley after recent incidents of discriminatory behaviour. Blues supporters have been under the spotlight in recent weeks after a number of high-profile incidents, including a derogatory chant about Spurs supporters that featured alleged anti-Semitic language at a Europa League match in Hungary last month. "This fixture is always a passionate encounter both on the pitch and in the stands, but in light of recent events and after consultation between both clubs and the Metropolitan Police, we would like to remind supporters of their responsibilities in keeping support positive," Chelsea said to fans in a statement. "Historically, a small minority has used the Tottenham fixture as licence to use anti-Semitic chants, noises and gestures.... Our position is clear -- this is no excuse for abusive chanting or behaviour and it will not be tolerated." Meanwhile a Spurs fan was banned and fined for throwing a banana skin at Arsenal's Pierre-Emerick Aubameyang during the North London derby in early December. A statement on Tottenham's website reminded ticket holders that "foul, abusive, homophobic or racist behaviour will not be tolerated".